Most salaried employees have EPF (Employee Provident Fund), which is regulated by EPFO. Earlier it was almost impossible to check your EPF balance in real time. But thankfully EPFO has adopted new technology with time and now you can check your EPF Balance almost real time in following 5 ways. Just give call to 011-22901406. The call gets disconnected after two rings and within minutes you get SMS with the EPF balance, UAN, Date of Birth, KYC status and last contribution. I like this the most as its free and instant. In case your EPF account is registered with UAN Portal, you would get automatic SMS alerts about EPF balance and status. It takes around 1 – 2 months once you have registered to get the first SMS but then the alerts are regular every month. EPF subscribers can download the EPF passbook by logging in Member Passbook Website. The passbook has monthly records of Employee/Employer contribution, Interest credited along with the final balance. Earlier the passbook was also available through the UAN website but it has been disabled for now. Just SMS EPFOHO UAN ENG to 7738299899 and you’ll get your EPF balance within minutes through SMS. The ENG in the SMS is for English. 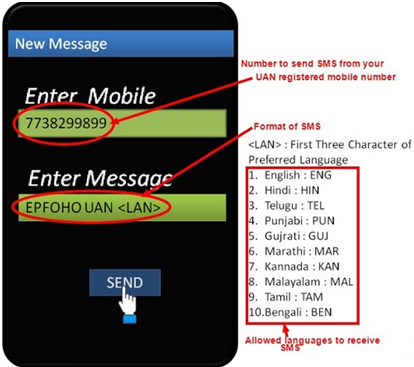 You can get the SMS is 10 languages. The picture below gives the details on what to use for which language. 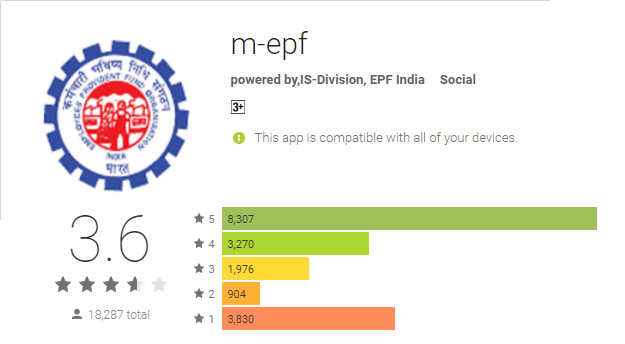 You can download the EPF App from EPFO. This app has all the features of the website and you can get your balance, monthly contribution etc from the same. For all the above, you should register and activate your UAN and your Mobile number should be updated in EPF account. Please Note there are some big employers who have their own EPF trust and so they do not deposit money with EPFO. In this case you would NOT be able to check your balance by any of the above methods. You’ll need to contact your accounts section or talk to HR about how you can check your EPF balance and contribution. Why You Should Check EPF Balance regularly? It’s a good idea to keep a tab on monthly contribution to EPF. There have been instances where the employer has deducted EPF from salary but failed to deposit it in EPF account. A regular tracking can help you keep a tab on these things. However always consider EPF as money for retirement and resist the temptation to dip into the same for some short term needs. Can anyone tell me why the Interest for FY17-18 is still not reflected in EPF passbook? Sir If a particular month’s entry is not there in the passbook , does it mean employer has not deposited the amount ? Is the passbook reliable enough to be considered as a proof of non deposit/deposit by the employer ? In this case, what can we do ? Just check if one month has double entry or double amount. In case it has there is NO issue. In case there is missing month and no entries of the same even later you must ask your employer. How to get updated passbook? each time I login and download the passbook, its old one i think around a year back when I first requested for the passbook. I think they wait for interest to be paid each year before updating the passbook? 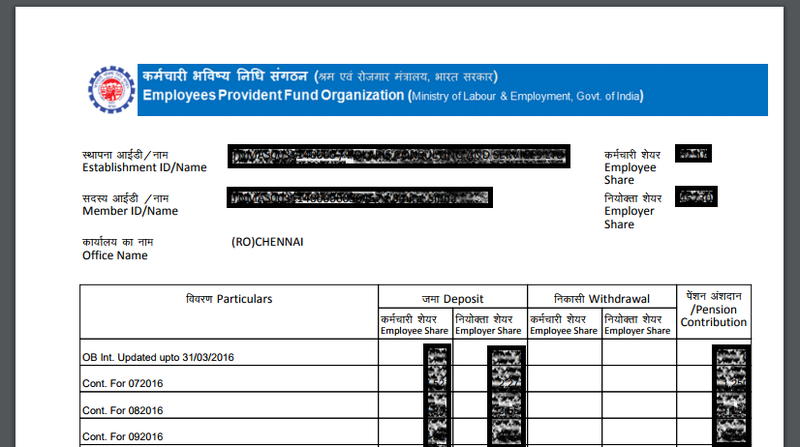 Sir I am getting EPF pension under EPS:95 past 11 years and shifted my residence from Chennai to bangalore. I don’t have any UAN number or KYC. Further as a senior citizen difficult to co-ordinate with Chennai. How update my latest record through online. Please speak to EPF Helpline number 1800-118-005 and see if they can help. I don’t think you can do anything online until you get your UAN. Also check your UAN status on this link.